I’ve come across this phase several times in the past few weeks within the context of “X released women from the drudgery of Y,” where Y was something that wouldn’t really fall under the definition of “drudgery,” to begin with. By drudgery, I mean work that in itself is not pleasant, that has no immediate effect in stimulating our best powers, and that only remotely serves the purpose of our general advancement. Lew Rockwell’s post for 9/26/2011— that would be today! 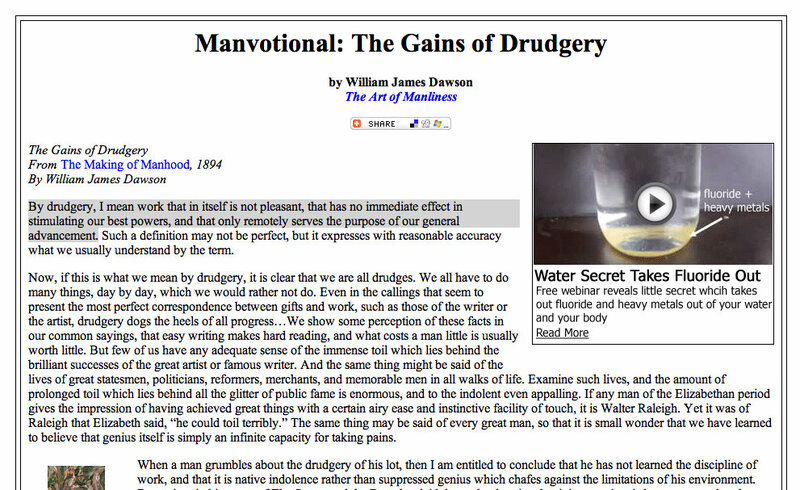 But the gains of drudgery are not seen only in the solid successes of life, but in their effect upon the man himself. Let me take in illustration a not infrequent case. Suppose a man gives up his youth to the struggle for some coveted degree, some honour or award of the scholarly life. It is very possible that when he obtains that for which he has struggled, he may find that the joy of possession is not so great as the joy of the strife. It is part of the discipline of life that we should be educated by disillusion; we press onward to some shining summit, only to find that it is but a bastion thrown out by a greater mountain, which we did not see, and that the real summit lies far beyond us still. But are we the worse for the struggle? No; we are manifestly the better, for by whatever illusion we have been led onward, it is at least clear that without the illusion we should not have stood as high as we do. Read the whole thing and come back. I’ll let this stand alone, even though I’ve not posted my watermelon picture– which is where I was headed.